Green Chili Stew is a fast and delicious home-cooked meal cooked entirely in the Instant Pot (or Pressure Cooker). 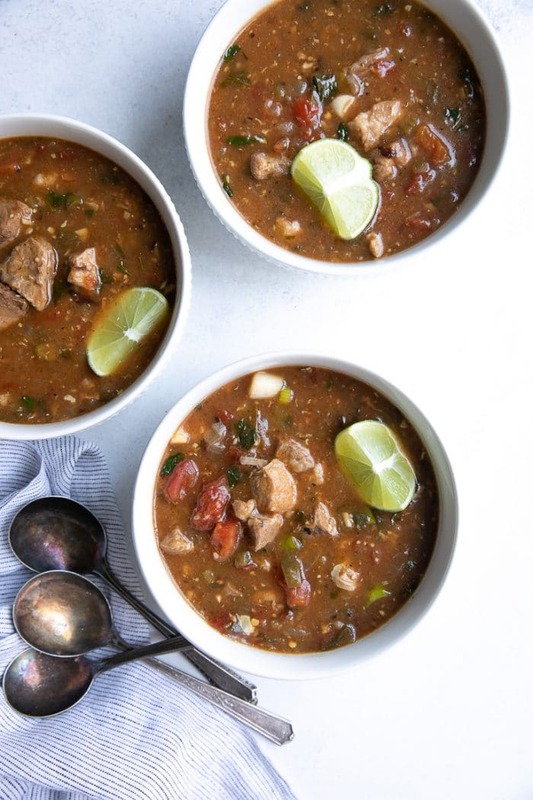 This easy Instant Pot Pork Green Chili Stew comes packed with tender, juicy chunks of pork bathed in a mildly spicy, tangy, and hugely flavorful broth. Basically, type one into Google, and you’ll get them all. When I asked Google for help explaining the difference, I just got more confused. 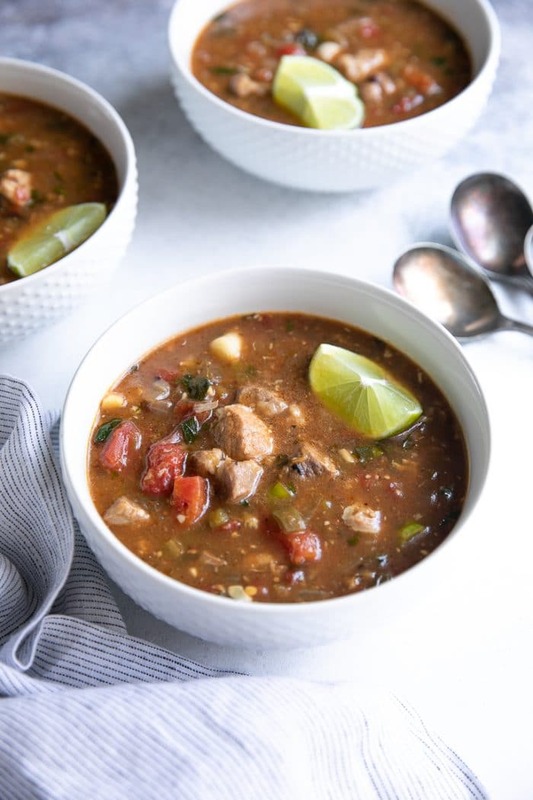 Fortunately, I did learn a thing or two while making this super delicious Instant Pot Pork Green Chili Stew…and trust me, it is delicious…all of which I have shared here for you guys today. Plus the recipe because I know we all want that. Let me start by saying that this is not an “authentic” green chili. And by “authentic” I mean that no, I did not make my very own homemade salsa verde, or enchilada sauce, or roasted tomatillos. 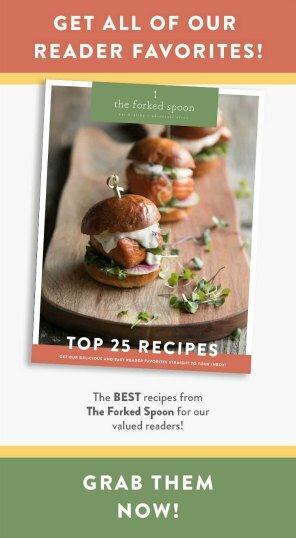 This recipe is all about getting a delicious meal on the table that (hopefully) the whole family will love. (translation- my child would only eat the pork). 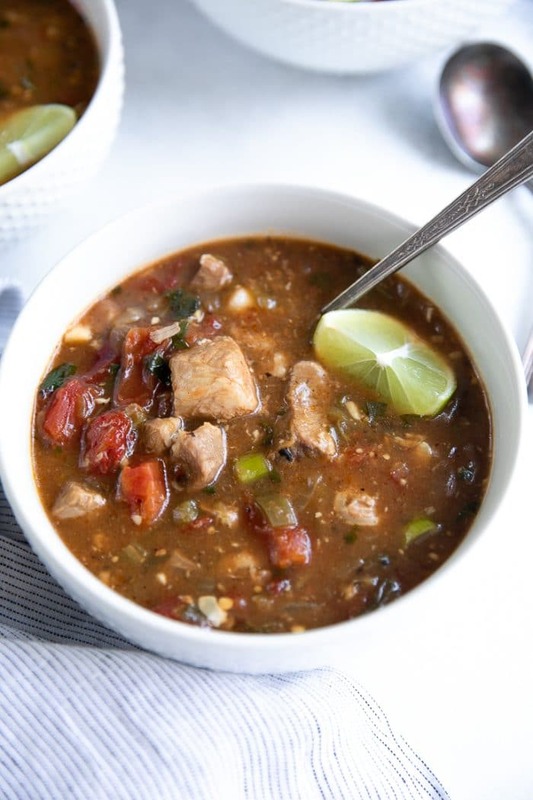 Making this green chili stew couldn’t be easier! You’ll need an Instant Pot (or pressure cooker) and approximately 45 minutes to an hour. To get started, set your Instant Pot to sauté. 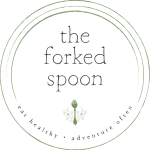 This basically turns the bottom of your Instant Pot into a skillet, so rather than sautéeing the onions and browning the meat in a separate pan, you can do the job right in your Instant Pot. First, you’ll add the onion and sauté until just starting to soften. Immediately after, you’ll add the pork and give everything a good stir. Allow pork to brown for several minutes, stirring occasionally. 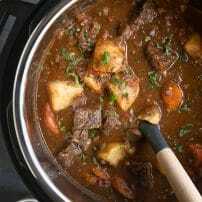 Why do we brown meat before adding to a stew? It is believed that the caramelized surface gives the dish a richer, deeper flavor. Since the meat will be pressure cooked in this green chili stew (rather than slow cooked), it isn’t as important. That said, a little 5 minute sauté is never a bad idea. Next, you’ll add the minced garlic and jalapeñ0s. If you are sensitive to spicy food, I highly recommend using just one jalapeño in this recipe rather than the two. Japapeños heat level is highly unpredictable and as such it is always best to start with less and add more as desired. Finally, now to the dumping part of the recipe! Dump in the canned tomatoes (with the juice! ), salsa verde, green enchilada sauce, green chilis, and cilantro. Give it a good stir, secure the lid, and pressure cook for 30 minutes. Once it’s finished, taste and add any additional salt and pepper, more cilantro and green onions. That’s all there is to it! Yes! Absolutely. In fact, I had initially planned on making this green chili in the slow cooker, like this slow cooker pot roast, but the day was getting later and I wanted to have a video for you guys, so, out with the slow cooker and in with the Instant Pot. To make this in the slow cooker (aka crock pot), I do recommend browning the meat in small batches before adding to the slow cooker. This is how I would do it. Heat a large skillet over medium-high heat. Add 1 tablespoon of olive oil and the onions. Sauté the onions, stirring often, until soft and translucent. Remove from the skillet and transfer to the slow cooker. To the same skillet add one more tablespoon olive oil. Add the pork, working in batches if necessary to prevent overcrowding the pan, and brown each side of the pork until golden and caramelized. Transfer cooked pork to the slow cooker (remember- it does not have to be cooked all the way!). Sprinkle the pork and onions with 1-2 tablespoons flour and mix well to combine. 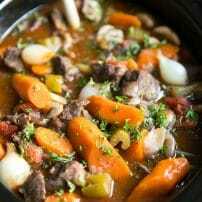 Add the remaining ingredients to the slow cooker, mix, and cover. Cook on high for 5 hours, low for 8 hours. 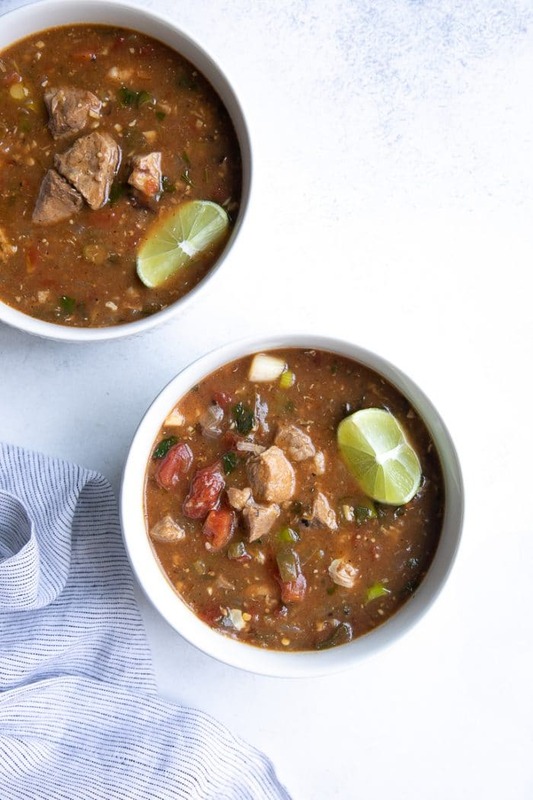 This version is just as easy as making green chili stew in the Instant Pot, you’ll just need to do better at planning ahead than me. Also known as Chili Verde (since verde is the Spanish word for green), green chili is a stew made with meat, beans (unless you’re in Texas- apparently Texans don’t like beans in their chili) and a sauce filled with onions, garlic, green chiles (poblano and serrano), jalapeños, and tomatillos. Depending on who you ask, you may or may not find tomatoes in their green chili recipe, however, given my love for all thing tomato, I made sure to add extra. That is why my green chili recipe is not actually green. That is also why I did not title this post “Authentic Green Chili Stew”. The green chilis in this stew are not of the spicy variety. With exception of jalapeños which may, or may not, be spicy. The salsa verde, green enchilada sauce, and canned green chilis were all made with mild chilis such as tomatillos, Anaheim, serrano, etc. 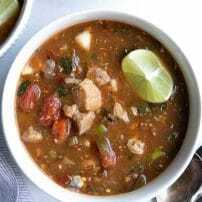 DON’T FORGET TO PIN THIS INSTANT POT PORK GREEN CHILI STEW TO MAKE FOR A FAST AND EASY DINNER, WHEN YOU HAVE THE FLU, OR ANY OTHER TIME YOU WANT TO MAKE A BIG BOWL OF SIMPLE, DELICIOUS CHILI. Green Chili Stew is a fast and delicious homecooked meal cooked entirely in the Instant Pot (or Pressure Cooker). 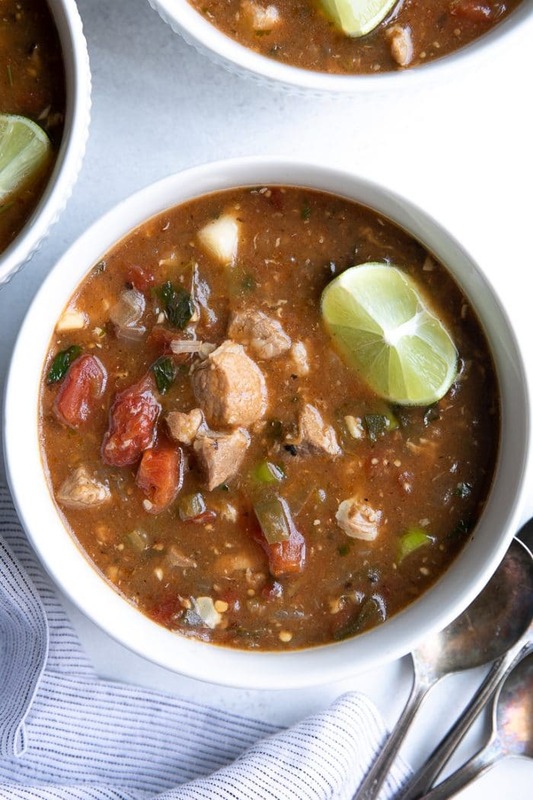 This easy Instant Pot Pork Green Chili Stew comes packed with tender, juicy chunks of pork bathed in a mildly spicy, tangy, and hugely flavorful broth. Set Instant Pot to the SAUTÉ function. As the Instant Pot heats up, season the pork with salt and pepper. Meanwhile, add the oil and the diced onion to the instant pot. Mix well. Sauté the onion for 3-4 minutes, or until soft and translucent. Add the pork to the pot and cook until sides have started to brown. * Add the garlic and chopped jalapeño and sauté with the pork and onions for 1-2 minutes, stirring constantly. Add the crushed tomatoes (with their juices), salsa verde, green enchilada sauce, chopped green chilis, and cilantro to the pot. Stir well to combine. Secure the lid on the Instant Pot and change the function to MANUAL. Set the timer for 30 minutes with natural release. Stir in additional cilantro and chopped green onion. Serve with cheese, sour cream, or tortilla chips, if desired. If you really want to brown the pork on each side, you will need to do this in small batches before adding the onion. For the sake of time, I added the onion first, followed by all of the pork. The pork was still delicious, juicy, and practically melted in my mouth. If your green chili is too soupy, mix 2 tablespoons cornstarch with 1/4 cup warm water and mix in with the green chili.